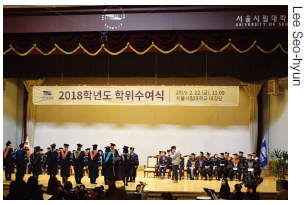 The Winter Graduation Ceremony of 2018 was held in the Main Auditorium on Feb. 22, 2019. The ceremony started with an introduction of the invited guests from the university. President Won Yun-hi and the Chairman Shin Weon Chul Seoul Metropolitan Council then delivered commencement speeches. There were 1,278 Bachelor degrees, 438 Master degrees, and 62 Doctor degrees awarded in total. The graduation ceremony started at 11a.m. and lasted about one hour. With mild weather and spring approaching, a new journey is ahead for these new graduates.